Exhibits that challenge the mind, body, and imagination are sure to excite our school-aged visitors. 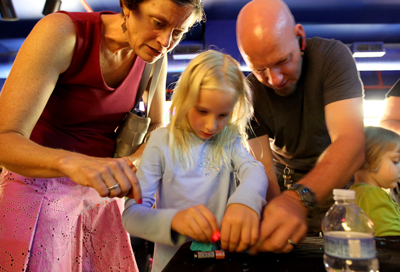 By offering the experience to learn through play, the Ann Arbor Hands-On Museum makes the most complex science concepts approachable and inspiring to visitors of all ages, and reinforces what students are learning in the classroom. Every weekend, the Museum offers special activities and programs – most included with Museum admission – designed to inspire and delight kids of all ages. Science, technology, engineering, art, and math intermingle in engaging and fun activities, ranging from make and take crafts to science experiments. To dive into specific topics with even more hands-on activities and experiments, the Museum also offers a wide range of evening workshops on Thursdays. Check our calendar or Evening Workshop page for details on these and other events and programming. The Ferrofluid Magnetoscope is one our visitors' favorite exhibits. Check out the video below!